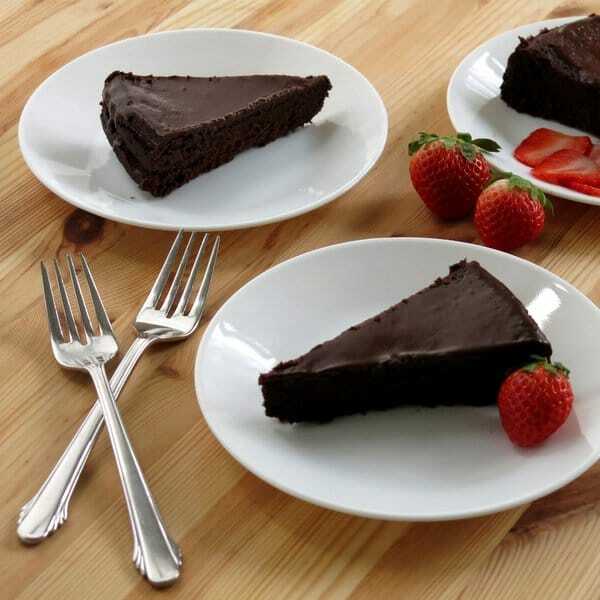 Flourless chocolate cake topped with dark chocolate ganache is a gluten-free and very decadent dessert. Even though I’m a health conscious mom, there’s a place for this at the table sometimes. Since then, he has tried Flourless Orange Chocolate Cake and is has trouble choosing a favorite. At first it seemed wrong to post such a decadent recipe today. I’m on the verge of taking on the 30 day #MushroomMakeover challenge. Mardi Gras is over. And, my youngest dd is allergic to eggs and wasn’t able to enjoy this one at all. But, upon further reflection, it is the perfect time for me. I’ve long believed that nothing is off limits when it comes to your diet. Eat wholesome, delicious foods that are good for your body most of the time. Splurge on occasion and make sure it is something you really enjoy. Don’t go crazy and everything will be just fine. I’ve been craving this dessert and decided it was time to indulge. I made this recipe mostly for me. I’ve never made a flourless chocolate cake before. Springform cake pans, water baths, endless egg whisking…it seemed a risky project and too much work was involved! Then, I ran across this recipe by Whole Foods. It’s straightforward, simple and delicious. My older dd and I thoroughly enjoyed a piece of this flourless chocolate cake before it was topped with anything at all. (By the way, this happens to be the reason I don’t have a picture of the full cake…too much experimentation.) A light dusting of powdered sugar is perfectly enjoyable. Adding strawberries (or raspberries) fully completes this extravagance. But, we decided to take the decadence over the top with a layer of dark chocolate ganache. The final product was, shall we say…out of this world. 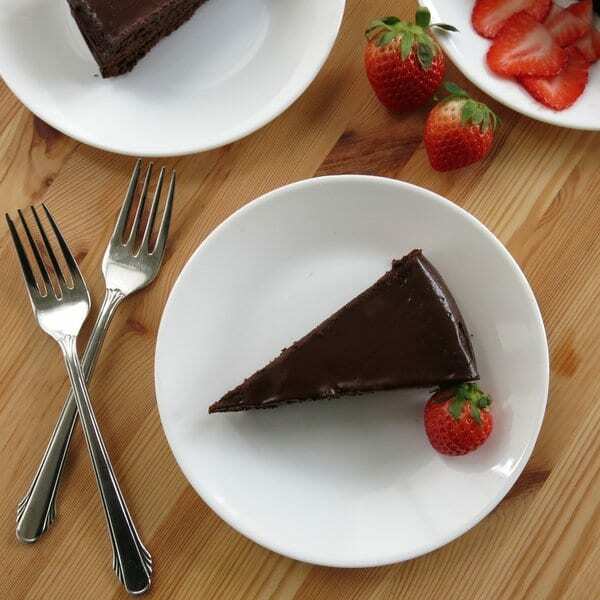 Sprinkle powdered sugar on this flourless chocolate cake, add a few berries or top it with dark chocolate ganache. It's a gluten-free and very decadent dessert! Line the bottom of a spring form pan with parchment paper. Spray the sides of the pan and the parchment paper with cooking spray. Melt the chocolate and butter in saucepan over medium-low heat, stirring to fully combine. Add sugar and mix to combine. Add eggs one at a time whisking thoroughly into mixture before adding the next egg. The mixture will become increasingly thicker. Add cocoa powder in quarter cup increments until combined. Bake for 35-40 minutes for a 9 inch round pan or 25-30 minutes for a 10 inch round pan or until cake is firm in the center. Cool for about 10 minutes and then invert and turn onto a plate, removing the sides of the pan. Melt butter and chocolate in a saucepan and stir to thoroughly combine. Step 6. What sugar? I only see powdered optional. Updated! Sorry for the confusion and thanks for letting me know! There is not butter listed in the ganache recipe, but it is in the first step. How much butter? Thanks for your note! 3 Tablespoons. Your cake sounds tasty, wish I had a slice. 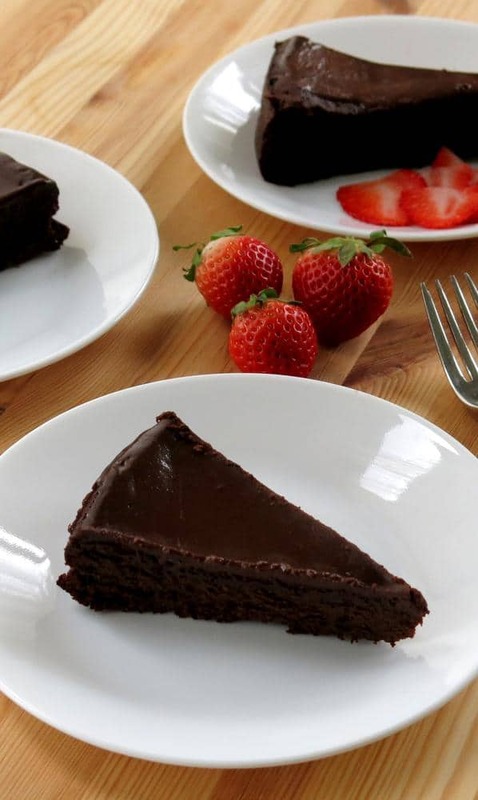 i love the richness of flourless chocolate cakes. this looks amazing! This recipe is by far the best chocolate cake I have ever eaten or made. So so so rich and delicious! Every time I make it I get rave reviews and it couldn’t be easier! I highly highly recommend to anyone! I add sea salt on top of the ganache for an extension ra zing! To die for!!! I’m so glad you liked it! Definitely adding a little sea salt next time! 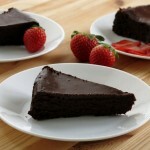 I searched high and low for a variation on the usual flourless chocolate cake recipe I make and found yours. It came together beautifully and the topping was so simple and delish. Everyone wanted another piece to take home! One problem, though, the cake sank slightly on top – yours looked so even, do you ever have this happen to you? Thanks so much for your comment! I have not experienced the top sinking, but I’m wondering if it needed to cook just a bit longer? I followed the directions and it certainly appeared thoroughly cooked when sliced. No worries, the main thing was how unbelievably good it tasted. 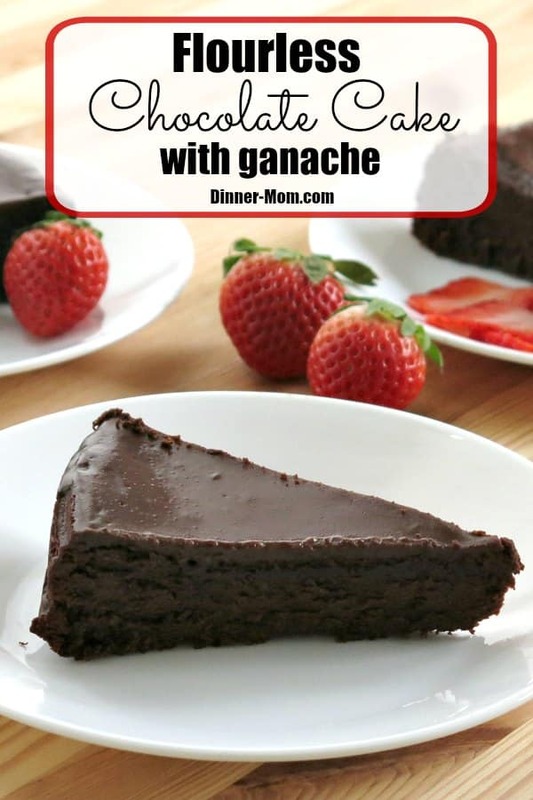 And, that ganache was so decadent yet easy to make, I am going to use it with some of my other recipes as I don’t always have cream in the house. I am so excited to make this. My Mother’s 91st birthday is coming and I am GF. It is very hard to get a GF desert in Restaurants. I will be doing a dry run tomorrow. Thank you in advance!!!! I made this for the first time last night for company and it was a huge hit. My husband said it was better than any flourless chocolate cake he has had in any restaurant. I’m so glad you liked it! Thanks for your feedback…made my day! Do you have suggestions to turning this into a springform mini recipe? I have 4″ mini springform pans to make individual desserts to take to friends. How could I convert the baking time of this recipe? thank you! Hi! I have not tried this, but you should be able to divide the batter between smaller pans. Keep an eye on the cook time as it may take less time. Good luck! Hi! I couldn’t find what size of spring form pan…9”? Hi! Yes 9 inch spring form pan. A 10 inch pan will also work, just adjust the time down about 5-7 minutes. Can I make this day prior to serving ?? Hi! Absolutely this can be made in advance and stores well. I wanted to make something that’s not the norm for me. I’m always on the hunt for GF recipes as my sister is GF in her diet. I’m the experimenter,if it’s good I pass it on to her. Not only was this cake super easy to put it together but oh so rich and beautiful looking. I love the idea of a ganche with honey in it. I baked mine for 40 minutes using a 9 inch springform pan. Everyone loved it, simply amazing! Yay! I’m thrilled that you liked it! I recently tried it using dark orange chocolate barks and it was delicious too…in case you want to experiment some more!!! In the recipe for the cake, is it 1 cup *and* 2 sticks of butter, or 1 cup=2 sticks of butter? Hi! 1 cup usually equals 2 traditional sticks of butter, but always check the packaging.